These Healthy Raspberry Thumbprint Cookies are so soft, chewy, and delicious (not to mention, easy to make! ), you’d never know they’re refined sugar free, gluten free, dairy free, and vegan too! 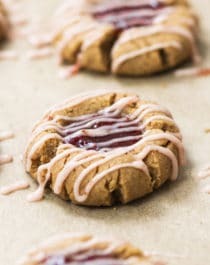 Thumbprint Cookies are just like regular cookies but with a teaspoon or so of fruit jam in the center, which adds a mouthwatering contrast in both texture and flavor. Like, one bite and you’ll be hooked. These Raspberry Thumbprint Cookies sure don’t taste healthy at all. They taste like they’re made with a ton of sugar and oil or something, but they’re not! They’re made with almond butter for a rich and buttery flavor and chewy texture. 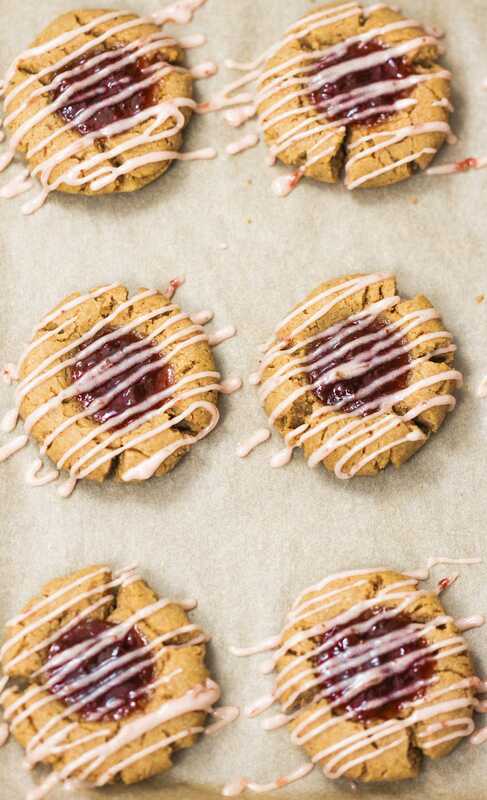 The raspberry jam in the center is smooth and sweet, contrasting the cookie in the most perfect and delicious way. The raspberry icing drizzle is like the “cherry on top,” but way better than a cherry, of course. I mean, it’s icing. C’MON. These Healthy Raspberry Thumbprint Cookies are so soft, chewy, and delicious (not to mention, easy to make! ), you'd never know they're refined sugar free, gluten free, dairy free, and vegan too! In a large bowl, stir together the almond butter, erythritol, almond milk, vanilla extract, and almond extract. In a small bowl, whisk together the oat flour, baking powder, and salt. Dump the dry ingredients into the wet ingredients and fold together. Form the dough into a ball. Break off chunks of the dough and roll into balls (I used a small cookie scoop to make sure all the cookies were evenly sized). Press the balls into thick patties between your palms and place them on a baking sheet. Use a teaspoon measure to indent “thumbprints” into the cookies. Fix any large cracks that form on the edges of the cookie dough, then fill each “well” with fruit spread. Bake for ~10 minutes. Do not underbake or overbake! Underbaking results in a delicate cookie that might fall apart. Overbaking results in a dry and crumbly cookie. Let cool compeltely on the cookie sheet. In a small bowl, whisk together the erythritol, fruit spread, and a few drops of water. Form an icing that you can drizzle. Fill a pastry bag with the mixture and snip a tiny corner off. Drizzle the icing over the cookies. Serve immediately and enjoy!